1 . 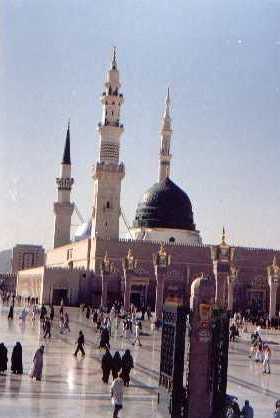 Once the Prophet sallallaho allihi wasalam said, "If anybody comes to Madina to see my grave, it will be just like as he saw me in my life, however, he would not get the honour of my companion". 2 . The grave of Prophet sallallaho allihi wasalam is actually the house of Syeda Aisha (RA) which was just adjacent to Masjid-e-Nabvi, but now it is inside the mosque. If you come into the mosque through "Bab-e-Baqqi", you will get it in your right hand which is the facing side of rodha-e-rasool and well known golden fence (grill) is fixed there. The biggest hole of the golden grill indicates the exact facing positions of Beloved Prophet Muhammed sallallaho allihi wasalam . Here faithful presents their Salaam from morning till night (In the night mosque has been closed where as in Ramadan it remains open 24 hours). You will find yourself on the feet side of grave if you enter from "Bab-e-Jibrael", which is next to "Bab-e-Baqqi". 3 . When Prophet sallallaho allihi wasalam passed away, syedna Abu Bakar (RA) said " Prophet is buried where he dies". Since the Prophet sallallaho allihi wasalam died in the room of his beloved wife Syeda Aisha (RA) , he sallallaho allihi wasalam had been buried there. The holy grave is made exact under the place where the bed of Prophet sallallaho allihi wasalam was placed at the time of death. The style of funeral prayer of prophet sallallaho allihi wasalam was little different as compared to the funeral prayer of other common muslims. There was no leader (IMAM) of this prayer. Since the Prophet (S. A. W.) himself was the leader of the whole universe, hence no one could dare to lead such prayer . Group of Muslims in Madina offered funeral prayer individually. 4 . Two more graves are also inside the shrine of Prophet sallallaho allihi wasalam. One of Syedna Abu Bakar Siddiq (RA) and other one of Syedna Umer (RA). Two shorter holes of the golden grill indicate the faces positions of Syedna Abu Bakar (RA) and Syedna Umer (RA) respectively. 5 . 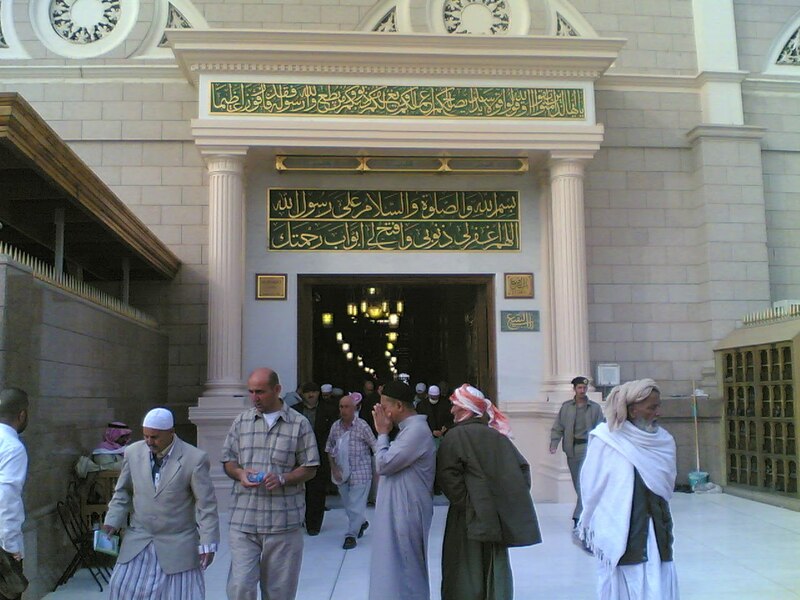 It is said that one more place is left in this shrine for Syedna Essa (Jesus Christ) - Second last Prophet of Allah. When he will come back again in this world by the order of Almighty Allah, he (AH) will fight against the enemies of Islam like one eyed dajal. After his death he(AH) will be buried in the Rodha-e-Prophet (S. A. W.). 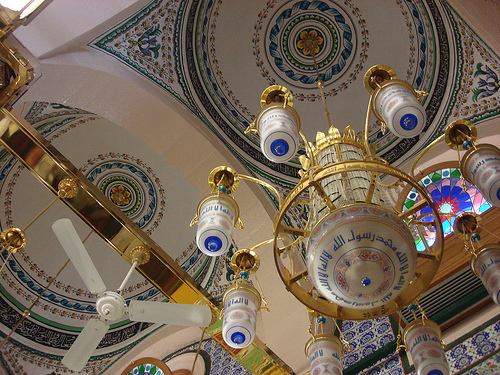 Beautiful ceiling in front of rodha-e-Rasool sallalla ho allihi wasalam. 6. If some one enters in masjid-e-nabvi through baqqi gate, he will find golden fence of rodha-e-rasool sallalla ho allihiwasalam just at his right . Men can use this gate at any time. women are not allowed here. 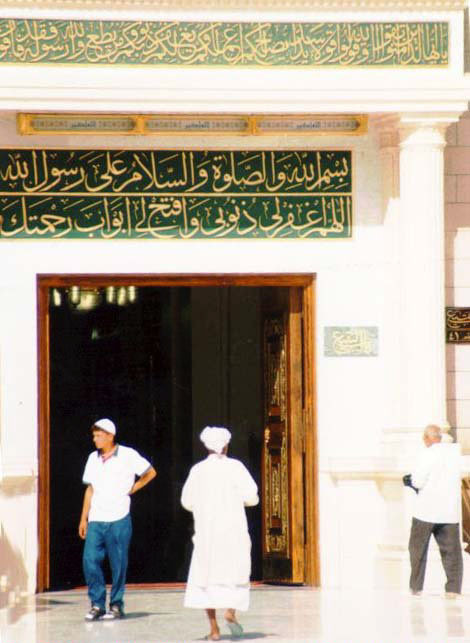 Ladies may use adjacent gate to baqqi gate named babe-jibrael for presenting salam to prophet Muhammad sallalla ho allihiwasalam.it may be noted that woman can use bab-e-jibrael in two specific times. One hour in the morning after salat-ul-fajir at 7 am and secondly in the evening after salat-ul-Asar at 4 pm. Exact times may be asked from khadmeen(workers on duty in uniform. filling waters, cleaning mosque etc) in masjid-nabvi. Except these two special timings men may use babe-jibrael too. Ladies special gate Bab-un-nisa remains open for them every time but this gate does not lead to rodha-e-rasool sallallaho allihiwasalam . ladies generally use this gate for 5 times prayers(salat). beloved prophet Muhammad sallalla ho allihiwasalam. ANOTHER VIEW OF BAB-E-BAQI .